I guess I’ll look back one day and laugh at the whole thing. But right now, sitting here in this spine-twisting camp chair in the middle of all the splashing, yelling, whining and cheering, with whistles screaming and horns blowing and the loudspeaker blaring to do this, go there and start that, I just want to pull my hat down over my eyes and stick my nose even deeper into my book. Glory, Hallelujah! Swim team is over for the summer. Don’t mind me. I’m not really a grouch. But I have done my duty as a devoted dad this season. I have sweltered under an unforgiving sun and burned the bottoms of my feet on the blazing hot concrete. I have inked the haughty challenge Eat My Bubbles! on the backs of small children. I have hauled coolers filled with healthy sandwiches and snacks four hundred yards from the parking lot, only to have my kids beg for pizza, pretzels and SnoKones from the poolside snack bar – and prove that the words bring back the change have no meaning here. So go ahead. Stick a fork in me. I’m done. It begins innocently enough, of course, and always with the best of intentions. You think: What a nice way for my child to spend the summer, to learn to swim with confidence, to make some new friends. You even put your name in as a volunteer. (You could use some new friends, too.) So you sign up your “midget,” then cast your eye on your younger child. Well, you’re going to have to be at the pool anyway. Might as well have both kids engaged in productive labor. In for a dime, in for a dollar. Sign up that “mite,” too. But like a frog in a pot of water slowly reaching a boil, you don’t even know you’re already cooked. Because it’s not the team that’ll drive you to distraction. It’s the meet. 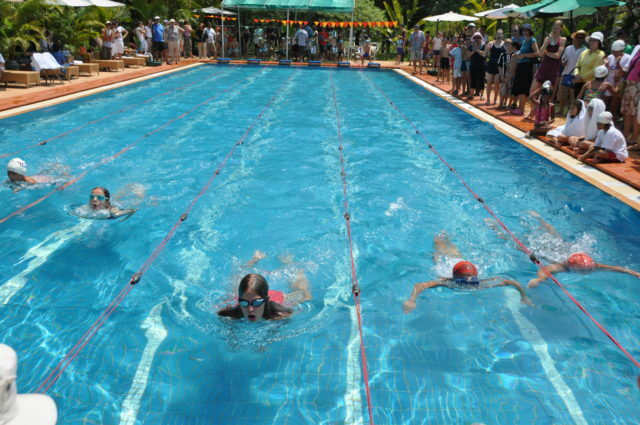 I was once a swim-meet rookie, unattuned to all matters aquatic, and it took some time to learn the ropes. First, observe the cardinal rule of all real estate: location, location, location. Forget about sitting at that table under the open sky. Instead, make a beeline for a spot under the pavilion where neither sun nor rain can touch you. Next, take your cue from the visiting-team families, camped out like gypsies around the pool perimeter. Beneath their E-Z UP portable canopy tents, they’ve stashed cases of bottled water, jumbo bags of potato chips, battery-operated fans, coloring books, crayons, stacks of magazines and the entire Sunday paper to keep everyone busy and contented between meet events. Because here’s the sober truth of swim meet. Your kid will probably swim a grand total of ninety seconds. But you’re going to be here all night. Sure, it’s all jokes and high spirits as the meet kicks off, and you saunter around sipping a Diet Coke and basking in the event. The loudspeaker squawks; people fan themselves; official-looking folks wave clipboards; every few minutes there’s a sudden splash. It’s like a giant stockholders meeting, except everyone is wearing crazy-quilt shorts, carrying toddlers, and complaining about the heat. But below the surface of the party atmosphere lie rules and organization complicated and time-consuming enough to rival one of those famous credit default swaps. Swimmers write the meet sequence on the backs of their hands to keep things straight, but the logic and nomenclature confuse me immediately. There are different age groups but also different divisions. The team swims dozens of events, but multiple heats in each event. There are quad winners, triple winners, seed times, drop times, strokes of the week. My midget placed first in one heat but forgot to flutter-kick and got a DQ (that’s disqualification to you civilians). But she’ll swim another straight race later. Unless she swims a medley – butterfly, backstroke, breaststroke and freestyle. Or is it a relay? Just pray for no thunder (speak not of it above a whisper), and maybe we’ll all be out of here before midnight. But until that final heat arrives, you surrender to swim meet. For you have lugged your cooler, packed your paperback, and staked your claim to a worthy piece of shade. You have stood next to your midget as she sang the National Anthem with her right hand over her heart and her left hand clutching a popsicle. Face it: Swim team is your summer family. And as I rise to watch my mighty mite race one more time, I wonder if the brigade we cheer is not they, but we, charging ever onward for the sake of our kids. The lines from Tennyson come ‘round again. Ours is not to bear reply. Ours is not to wonder why. Ours is just to do or die. Then start all over again next year.